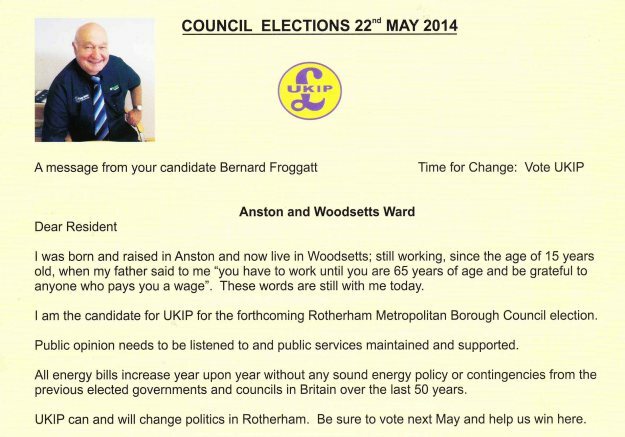 This entry was posted in Elections 2014 and tagged Anston & Woodsetts Ward, Bernard Froggatt, UKIP, UKIP Rotherham by Rik. Bookmark the permalink. If he is like the Rawmarsh guy then Astonians will be full of cheer!!! I wonder if he will be bringing some Christmas cheer to Anston, a Christmas tree would be nice, but we have had six years of excuses why we can’t have one of those. Woodsetts a village a quarter of our size rolls one out every year, in the centre of the village. Perhaps Bernard can have a word with father Christmas and arrange. Or this year the fairies may put one up, while every body is asleep. To be honest I don’t agree with many UKIP policies but one thing is for sure, Labour in Anston need to get a bloody nose in the elections it things are not going to change. If UKIP manage to take out the trash then more power to them. If he was anything like Caven (the Rawmarsh guy) he would be writing about what he can do for Anston and Woodsetts, not just a couple of sentences out of UKIP national policy. Are there any Clean Coal plants in production anywhere in the world? That’s the problem, it seems to be about national policy and not what he can do for Anston. I want to know what he will do for Anston and I best not forget Woodsetts. I have written an open letter to the Guardian asking him to state what he will do to improve the life’s of Anston people. If you combine Anston and Dinnington, we are actually as big as Retford, Dinnington has a decent shopping centre and a few services, the good folk of Anston have nothing. When I was a teenager we had a great Youth club, but there is nothing for the kids. We have lost our local library and council offices in South Anston. We shared a swimming pool with Dinnington, that we donated 50% of the proceeds to as children, which was trashed by RMBC. In fact Anston is nothing more than sprawling housing estates with no facilities and shops. Yes Tim, that’s the problem that I see. the “80% of our laws are controlled by the EU” paragraph is utter nonsense. (it’s not that I’m defending the EU Commission – they are near hopeless (based on my long experience of working with them!) but it helps if you get your facts right, ). Anyone hoping to be elected in the Parish or Council elections should be campaigning on local issues alone. Anybody know who is standing in Aston? Regular reader. UKIP nearly beat the Liberals in Eastleigh, but the main reason they failed is that the Liberals had control of all the ward councils. So what UKIP are trying to do is gain control of all the ward councils across Rotherham. I was going to stand for UKIP in Anston, but I wasn’t willing to stand on national issues, I was happy to discuss the immigration issue off line, but I wouldn’t have been happy it being in on a flyer I was involved with, as it isn’t an issue in Anston. That doesn’t mean you have to agree with them all and UKIP don’t whip there Councillors so we can represent the community we are elected to represent with out fear or favour that’s why I joined UKIP after being a Independent for many years. 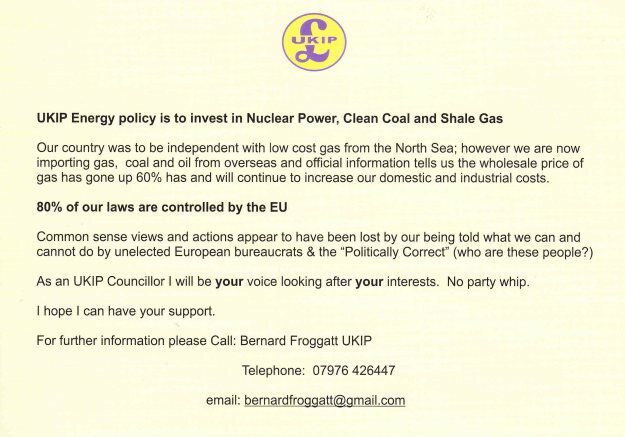 So please don’t keep bleating on about UKIP national policies doing anything for Anston. Like I do in Rawmarsh we know and respect the tax payers wishes and in doing so we do all we can for the wards community And unit we gain a majority in the Council all we can do is keep plugging away representing the people we are elected to represent. The people of Rawmarsh was brave enough to give me a try and we will know in May if I have gained there trust and honoured my pledge to them as a UKIP Councillor. The more blogs the better as far as I am concerned! The more people that are mobilised, keeping a close eye on those that claim to serve us, the greater the chance that change will come. Welcome to the blogosphere, Tim and all the best for the future!. Bernard and his wife are personal friends of mine. I live in the South of England and don’t know much about the needs of your area but I do know that Bernard is probably the nicest, most honest gentleman that it has ever been my pleasure to meet. If he says he is going to do something then he will move hell to the high water line to get it done. Go get them Bernard !